Pick Analysis: Instead of following the path of his father, Jerry, to major league baseball (played catcher for three teams over six seasons), Goff starred as a high school quarterback in the Bay Area. Cal coaches put him right into the fire in 2013, and he answered the challenge as the school's first-ever freshman opening weekend starting quarterback. The honorable mention All-Pac-12 pick (18 TD, 10 INT) set school records for passing yards (3,508), passes completed (320), and passes attempted (531) on a 1-11 team lacking great talent. He suffered an injury to his throwing shoulder in the "Big Game" against Stanford that year, but managed to return for the 2014 spring game. In fact, he started all 12 games as a sophomore, completing 62.1 percent of his passes for 3,973 yards and 35 touchdowns against just seven interceptions. Goff capped his career at Cal with a first team All-Pac-12 season, starting every game and setting conference records with 4,719 passing yards and 43 touchdowns on the year. The Bears also won their first bowl game since 2008 when Goff threw for 467 yards and six touchdowns when they took out Air Force in the Armed Forces Bowl. Even before that victory, however, Goff decided to move on to the professional ranks after the season as one of the top quarterback prospects for the 2016 NFL Draft. Published: April 28, 2016 at 08:22 p.m. The Los Angeles Rams select California quarterback Jared Goff with the No. 1 pick in the 2016 NFL Draft. What is the Rams' plan for Jared Goff? Published: May 2, 2016 at 04:39 p.m. The "Path to the Draft" crew discusses what expectations will be for Los Angeles Rams quarterback Jared Goff and how he will fit in with the team. Is Jared Goff surrounded by the right pieces to succeed? Published: April 30, 2016 at 10:35 a.m.
Our crew breaks down if Los Angeles Rams quarterback Jared Goff is surrounded with the right talent to succeed in the NFL. Published: April 13, 2016 at 08:40 p.m.
Take a look at the college highlights of California quarterback Jared Goff. 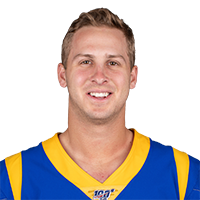 Published: April 30, 2016 at 11:30 a.m.
NFL Media's Steve Wyche goes 1-on-1 with the newest member of the Los Angeles Rams, quarterback Jared Goff, after being selected No. 1 overall in the 2016 NFL Draft. Published: April 28, 2016 at 08:24 p.m.
Jared Goff reacts to being drafted by the Los Angeles Rams with the No. 1 pick in the 2016 NFL Draft. Published: April 28, 2016 at 08:26 p.m.
Los Angeles football fans are celebrating the Rams' No. 1 overall draft pick of Jared Goff at the draft party. Published: March 2, 2016 at 06:29 p.m.
Get to know University of California quarterback Jared Goff, who is expected to be one of the top two quarterbacks taken in the 2016 NFL Draft in April. Published: Dec. 4, 2015 at 02:51 p.m. Published: Feb. 25, 2016 at 07:18 p.m. The pocket passer from Cal can throw a crips pass. He's also a fan of Taylor Swift. Published: Feb. 19, 2016 at 09:39 p.m. Check out some highlights from Cal quarterback Jared Goff.